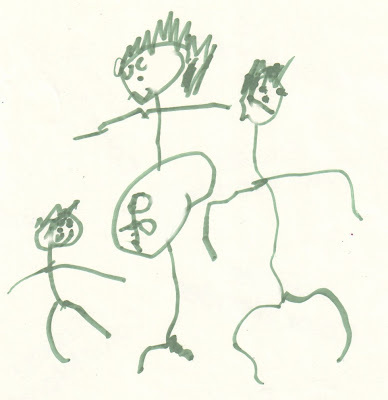 Actual drawing by Ben of our family when I was pregnant with Liam. 1. Exactly five years ago today I got my hoo-ha shaved by a large German woman. 2. I've never had a contraction, not even Braxton Hicks. 3. Adoption is way easier than pregnancy. 34 weeks pregnant with Liam, and hot and miserable. 4. It's a tie between Doritos and ramen noodles for the worst thing to have to throw up. 5. I gained 125 pounds in the four months between delivering Liam and getting pregnant with Amelia. 6. 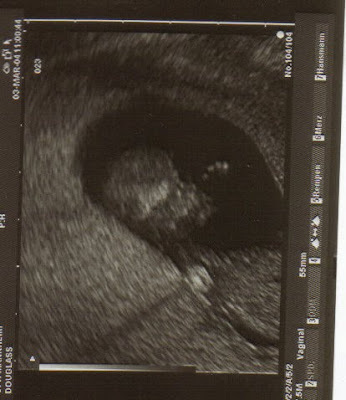 I was pregnant for 17 of the 21 months between December 2003 and September 2005. 7. German baby gear is far superior to American baby gear. 8. Clomid made me evil. Evil with a heaping spoonful of insane. 9. No one told me that I'd bleed after a c-section. 10. Exactly five years ago today Liam was born! The first time I saw him, after a night long fight with German nurses who wouldn't let me near him. Isn't he a lovely shade of blue?